Bills that passed almost unanimously in 2005 have run into trouble this time around. When Hurricane Katrina hit in 2005, Congress passed two relief bills almost unanimously. 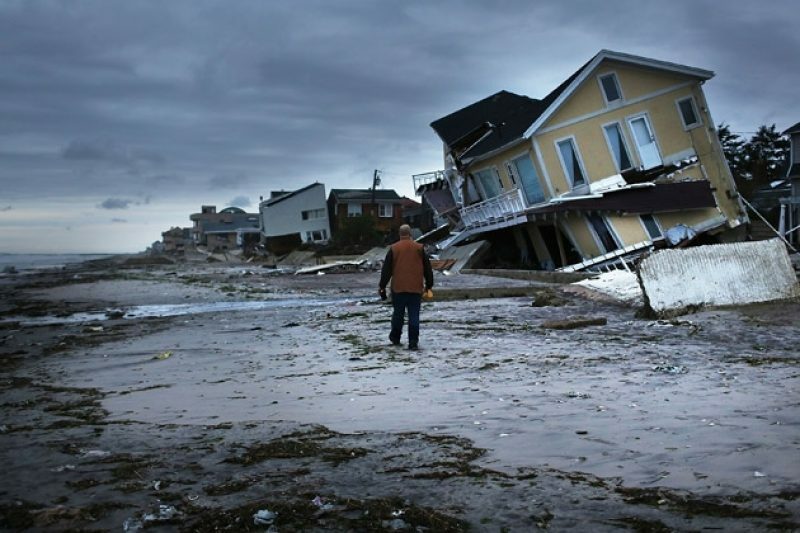 But when it comes to Hurricane Sandy, some in Congress seem to have had a change of heart. After Katrina, a $51.8 billion relief package passed the House of Representatives 410 to 11. Another bill, which allowed the National Flood Insurance Program to borrow more money, sailed through 416 to 0. On Tuesday, the House passed a $50.7 billion relief package for Sandy. This time, 180 representatives voted against it — 179 Republicans, one Democrat — 56 of whom had voted for the similarly sized Katrina bill. Another Sandy bill earlier this month also garnered opposition. That bill, almost identical to the one on the flood insurance program passed after Katrina, was opposed by 67 representatives, all Republicans. In total, 58 representatives voted against bills this month similar to ones that they had supported after Katrina. What accounts for the legislators' changed votes? "The difference is the fiscal state of the country," Jason Klindt, a spokesman for Rep. Sam Graves, a Missouri Republican, wrote in an email explaining why Graves voted for both of the Katrina relief bills but against the ones for Hurricane Sandy. "The days of buy now and pay later are over," he added. Klindt said Graves would have supported the bills if they had offset the costs with spending cuts. The $51.8 billion relief bill passed after Katrina and the $50.7 billion one that passed the House on Tuesday aren't exactly the same. 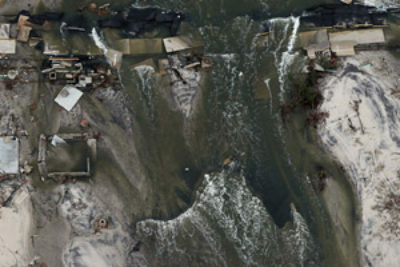 The Katrina version allocated almost all of the money to the Department of Homeland Security for disaster relief, while the Sandy one directs relief money to a slew of federal agencies. Conservatives derided some of the provisions of the Sandy bill as pork. As they point out, the bill allocates billions to dozens of federal agencies, including the National Park Service, the Smithsonian, Immigration and Customs Enforcement, the Secret Service, the Federal Aviation Administration and the National Oceanic and Atmospheric Administration. But the bill also specifies the agencies must spend the money on Sandy-related expenses. As for the votes against the flood insurance program, the Katrina and Sandy bills were basically the same. But there is an important difference: The program has fallen at least $20 billion into the red since Katrina. And it doesn't take in enough revenue to pay the money back. The Katrina bill raised the limit on borrowing for the program by $2 billion — subsequent legislation increased it by billions more to cover Katrina-related losses. And the Sandy bill upped the borrowing limit by another $9.7 billion. "We're continually bailing out this program and it's clear that it's no longer solvent," said Heather Vaughan, a spokeswoman for Rep. Randy Neugebauer of Texas, who voted to let the flood insurance program — which insures 5.7 million homes — borrow more money in 2005 but against it this month. "It would be irresponsible to raise an insolvent program's debt ceiling without making the necessary reforms," Rep. Paul Ryan of Wisconsin said in a statement after the vote this month. How did the flood insurance program fall so deeply into debt? The short answer is Hurricane Katrina. "The program worked well for a good number of years," said David Maurstad, who ran the program from 2004 to 2008. Funded by annual premiums paid by homeowners, the program was self-sufficient and had even built up a reserve of about $2 billion by 2004, according to Maurstad. But it wasn't designed to handle a catastrophic year like 2005, when Hurricanes Katrina, Rita and Wilma left the program on the hook for $17.7 billion in claims. So Congress authorized the program to borrow the money to pay the claims. But the flood insurance program didn't have any way to repay those funds. It takes in only about $3.5 billion a year in premiums, and the claims have overwhelmed premiums in four of the last eight years. One representative actually voted against the big Katrina relief package but in favor of the Sandy one this week: Rep. Scott Garrett of New Jersey. Garrett did not respond to requests for comment on the vote.